Best Site for Sit N Goes | Comparisons of the SNGs at major poker sites, find soft games and great software. 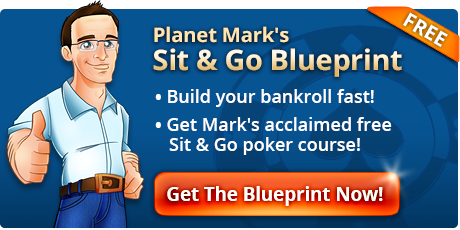 Sit N Go Blueprint Course | My popular free course - how to beat Sit N Goes for a good hourly profit. Jackpot Sit N Goes | Turn a small buy-in into a big jackpot win by hitting 5 or 6 in a row. $20 Extra Free to Play Sit N Goes | Special deal for SNG Planet readers at Titan Poker, click for info! Are Sit N Goes Getting Harder In 2019? 5 Tips For Becoming A Sit N Go Grinder! Fish-O-Meter - Finding Profitable Sites! How Often Will You Get Called? More Bubble Articles In The Overflow! Are SNG Tournaments Becoming Harder? Harrington's 'M', Useful In SNGs? How To Exploit Multi-Tabling Opponents! To this day Sit & Goes remain one of the best ways to build a poker bankroll while gaining valuable experience. These games have grown from being standard 1-table formats to a whole genre of their own – with a huge number of sizes, structures and game variations to choose from. Sit N Goes are now both a means to an end and an entertaining way to enjoy poker. What I recommend readers do is to use these to build their poker funds, then use your skills and money to take a shot at multi-table tournaments – where the potential for a huge payout exists – or even cash games. Here are some of the key types of Sit N Go games to look out for. 1-Table Tournaments: Sometimes known as STTs (Single Table Tournaments) this usually describes the 6 or 9 player standard Sit and Go tournaments. Nowadays you can choose from several different speeds and game variations. 1-table tournaments get a lot of traffic, making them ideal for multi-tabling. I teach you how to build a bankroll from these games in my free course ‘The $16 per hour SNG Blueprint’. MTT Sit N Goes: These range from 12 players (2x 6-max tables) through to 20 tables and 180 players – at which the line between Sit N Go and tournament strategy becomes blurred. Popular variations include 18 players and 45 players, with 90 player games also gaining in popularity. Again the speed of these games varies. Double Or Nothing / Fifty50: These are 10 handed SNGS which pay out half of the players each time. With DoN SNGs you are rewarded only for surviving, as it does not matter whether you have 10k chips or 1 chip when the 6th player is eliminated. PokerStars run Fifty50 games instead, which split half of the prize pool based on chips and the other half for suriving. Jackpot SNGs: Win 5 or 6 of these in a row (depending on the game) to win jackpot prizes ranging from €2k to €35k. Titan Poker is the place to head for these games, I should warn that the fee is higher – the extra fee is what keeps the jackpots growing. Steps SNGs: These are set up so that winning or coming 2nd in a small buy-in game wins you a ticket to the next level up, with 3rd / 4th giving you a ‘try again’. Great for building experience, these games often have exit points where you can swap your Steps ticket for entry into a big multi-table tournament – even the Sunday Million! Getting to the top of the ladder, which varies from site to site, will usually land you a huge prize. Knockout Bounty SNGs: Here the prize pool is divided between the last finishing positions and a bounty on each players head. You knock out a player to win their bounty. A fun variation in which you should not expect to see any friendly ‘checking down’ when a player is all-in! Hyper / Super-Turbo Sit N Goes: Starting with 300 or 500 chips, these games have 3 minute blind levels and put you into push / fold mode almost from the start. Great for getting a ton of volume into a short space of time. Satellite Qualifiers: Games which offer seats in big events (or sub-qualifiers) are a category all of their own, you will need to adjust your strategy at the bubble in these games. Lottery Sit N Goes: These games have a random prize pool, which is usually between 2x and 1000x the initial buy-in. Most are 3 handed, with super-turbo structures, averaging less than 10 minutes to play. The incentive of a huge win attracts recreational players – making the action crazy at times. There are already variations of this coming through, including the bounties of the ‘Sit & Go Hero’ games at Party and the live event qualifier ties in with the US friendly Lottery Sit N Goes at America’s Cardroom. Looking for the best way to get started? I recommend you check out my free ‘Blueprint’ course, which will teach you how to crush SNGs over 4 e-mailed installments. Click here for a preview! With so many poker variations competing for your attention, I thought I would use this area to make the case for choosing SNGs! While this may not be the most glamorous area of poker, there is plenty of money to be made for players willing to learn the unique strategy and just a little of the math which applies to these games. #1 – Consistent Bankroll Builders: This has been my number 1 reason to love SNGs for years now. You can use these easy-to-beat games to build your bankroll, then use that money to take a shot with cash games or tournaments. If you hit a rough patch, the *boom* back to the Sit n Goes to rebuild the money and your confidence. #2 – Opponents Keep On Making Mistakes: With so many mistakes made, you can play a ‘defensive’ style until the bubble and make great profits at the same time. This tight style is ideal for multi-tabling several games at once, and more games = a bigger potential for profits! #3 – Many Variations To Choose From: You can pick your favorite game, structure and speed and still find the games for you. With Steps, knockouts and satellite qualifiers on top the choice becomes even wider than before. #4 – Skills Transfer To Bigger Tournaments: When you hit a final table in a bigger tournament event you will be very glad you played SNGs and are familiar with the push / fold game and short-handed play. 90 and 180 SNGs are similar enough to mini-tournaments that you will have more general strategy under your belt too. #5 – Bonuses And Loyalty Deals: With lower variance in results than either tournaments or cash games, SNGs are ideal for clearing those bonuses. I have detailed the clear-rates and bonus amounts from all the major sites here.